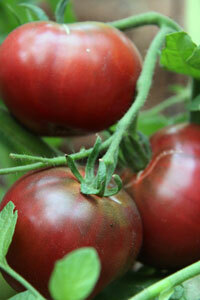 The Cherokee Purple tomato is a very popular heirloom variety and a member of the "black" color tomato group. This variety is known for its rich, complex smoky flavor as well as it's unusual color. It was reportedly first cultivated by the Cherokee Indians before becoming commercially available in the early 1990's. This striking tomato is one of the more widely grown beefsteak type tomatoes and is one of the slower growing tomato varieties with a maturity of 80 days. It is an indeterminate type that can reach a height of nine feet so is usually staked or caged. Its dusky-red fruit has a beautiful dark red interior with seeds surrounded by green gel. The plants are productive with large fruits good for sandwich slices. Its appearance is similar to the Black Krim, but is thought to be a little less productive and a bit more prone to cracking, though your experience may differ. I recommend buying Cherokee Purple tomato seeds at TomatoFest because not only do they specialize in heirloom tomato seeds that are certified organic, but their service is great and their staff friendly.